Maggie Pill Mysteries: What's a Pre-order? Of course we know what a pre-order is. You want a book that isn't out yet. You tell Amazon about your longings and they let you sign up to get the book the minute it's available. You don't have to remember the release date and then go look for the book; it just shows up on your device. Pre-orders are helpful for authors too, at least if what I'm told is true. They're counted as sales when a book launches, which bumps it higher in the rankings, which means more people see it and hopefully want to buy it. That creates a nice little circle effect: notoriety brings sales, and sales bring more notoriety. 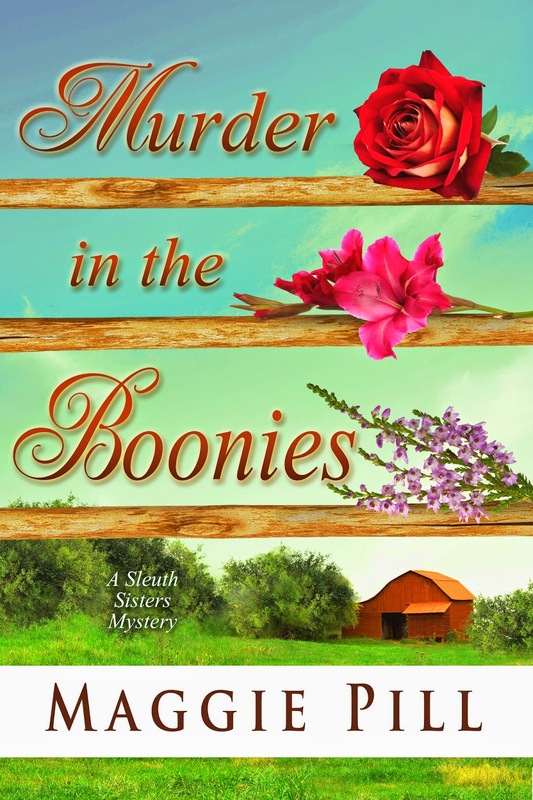 All that's said to let you know the third Sleuth Sisters mystery, MURDER IN THE BOONIES, is up for pre-order. The release date for Kindle is May 20. Print books might come later, because there's final proofing that requires ordering physical ARCs (advance review copies). Print books require different files than e-books, so that last proofing is a good idea. Retta's been overseeing the family farm since the sisters' parents died, renting it out and splitting the money three ways. When the current renters disappear with hardly a minute's notice, she's at first angry and then curious. She talks Barb into trying to find out where the family went and why. Faye sees the tenant-less farm as an opportunity to start a retirement home for work horses, something she's always dreamed of doing. All sorts of surprises follow, including some unsavory characters who seem bent on causing mayhem. Things come to a head when the sisters go to Mackinac Island to pick up their first retiree, a horse named Dolly. Suddenly they're responsible for more than the horse. They have to save a young girl, capture some killers, and stop an impending disaster. We know they can do it: Sister-power to the rescue! I am so excited the next book will soon be available. I love the first two! Thank you! They're fun to write.